Ahh, the man that is GaJol. I've written about his tech twice before, once about the old Skull of Orm deck and once about his distress deck. I'm not really sure exactly what he's up to these days, but the word on the street is that he's back in Sweden again for the foreseeable future. GaJol teamed up with Viktor "Oldschool" to prepare for BSK. The deck he put together is definitely one of my favorites from the tournament. I'm not really sure what is maindeck and what is sideboard here though. I believe that the cards on the last row are most of the sideboard, except for the fourth Priest of Yawgmoth and the Berserk, and that the two All Hallow's Eve are supposed to be in the board. I know around 15 years of the card's history. It was acquired by a guy in Texas around 97/98, and then sold to Roland Johansson in 2005. 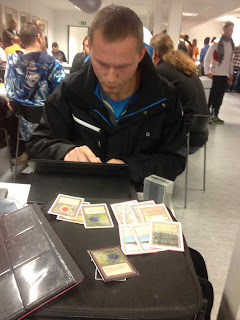 Among it's sightings in Gothenburg, Roland played the card to the finals of the Gothcon Vintage tournament in 2007, and won that tournament again with the card in 2008. There is actually a previous picture of the card at this blog as well, from my short deck tech about Roland's machine head ponza from n00bcon 5. I wonder who opened the card, and if that person was more impressed of a Craw Wurm or something from that pack. Not an impossible scenario. This format can at times look somewhat expensive. One could argue that it would be cheaper to play - and get new decks for - Type 2 for about 40 years than to buy a deck like Freespace's 5c Machine Head. That may be true, but nonetheless there are very viable budget alternatives in 93/94. 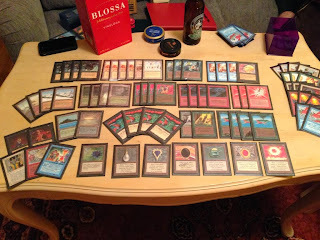 Black Lotus and Moxen are great cards, but they are probably less broken in 93/94 than they would be in any sanctioned format. Playing skill and evaluating the meta goes a long way, even when battling uphill against power. One of the players that illustrates this is Henrik "Brorsan" Jerberg. Brorsan is one of the driving players from Varberg, hosting his own Brorsan Invitational each year and contributing greatly to the older casual scene in his town. 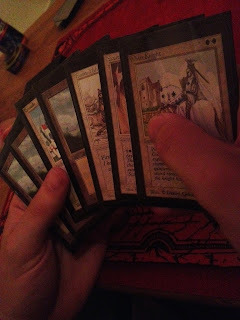 He does own full power (for his cube, of course ;)), but he doesn't play it himself in Old School tournaments. Nonetheless, he won both Kingvitational in June and BSK 2013 two weeks ago with slightly different takes on white weenie. 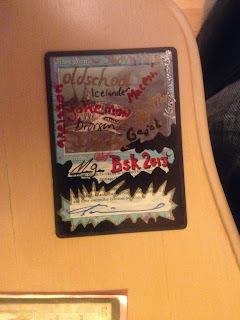 The decks to beat section have been updated with 7 of the 8 decks from the elemination rounds at BSK 2013. The missing deck is Brorsan's winning WW list, but the other sweet decks can now be viewed in full glory. I'm sure I'll discuss some of these decks in more detail in the future, as well as some of the decks that didn't make the cut (in particular GaJol's reanimate deck was awesome). The Djinns and Efreets are showing up in big numbers this time. As control has been somewhat weakened, the big Arabian Night's creatures can dominate the board more easily. In the coming weeks I'll be showing some of the decks played at BSK. We'll start with Viktor "Oldschool" Peterson's Powertwist Dream deck. Viktor mainly builds his decks on his own, and then rigorously tests them against a gauntlet of his other decks to see how his creations play out. 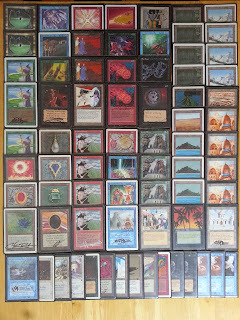 The first version of this deck was played at n00bcon 4 (Easter 2012). That version wasn't tested that much, and Viktor opted to play some other strange decks during BSK 2012, n00bcon 5, and Kingvitational. After some more playtesting and tweaks though, Powertwist Dream really broke some backs at BSK last weekend. It looks somewhat yanky and strange, but this version really holds together surprisingly well. Weekends like this really warms up the cold November rain. It included a tour back to the pubs of my old university, learning Roborally with my girlfriend, an awesome Vintage tournament at BSK, and finally getting my hands on the most powerful of the Power. Most of all though, it was time for the annual Old School Shark tournament at Scandic Plaza in Borås. I was planning to stay with Honka and Freespace. We were to compete as the dreaded Team Lederhaups, but Honka could unfortunatly not make it due to exams. Instead the third bed in our suite was filled by the amazing deckbuilder and all-round good guy Viktor "Oldschool" Peterson.